Nestled in a quiet, residential setting one block from the Sunset Strip, 1345 Havenhurst features a boutique collection of 16 contemporary townhomes, each unique in layout and perspective, set amidst a stunning backdrop of the Hollywood Hills. 1345 Havenhurst offers residents the chance to select from a collection of versatile floor plans and choose a residence that best suits their lifestyles. Multi-story townhomes are intelligently designed to enhance height, light, and views with soaring ceilings and floor-to-ceiling windows. 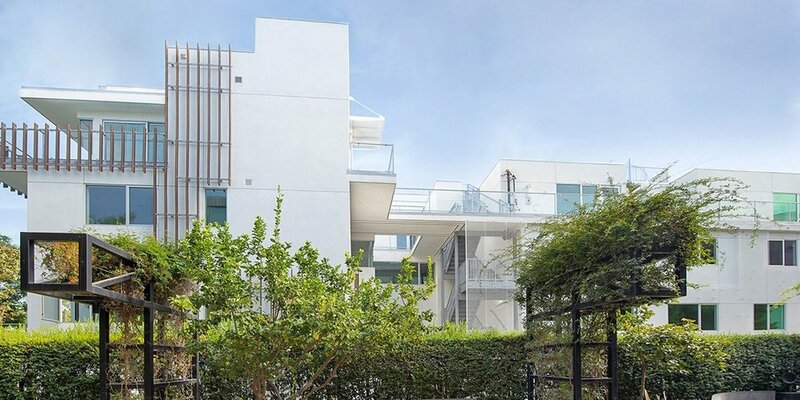 The Garden Terrace homes feature private balconies, either overlooking the neighboring tree-lined streets or located beside the building’s living, green wall. Townhomes in the Penthouse Collection boast rooftop terraces capturing 360° views that stretch from the Hollywood Hills to Century City and Downtown Los Angeles. A true rarity in West Hollywood, 1345 Havenhurst was uniquely configured to provide privacy while maximizing far-reaching views. View corridors will be preserved with no new construction on the block permitted to rise above three stories. The building is surrounded by greenery and neighbors a tranquil community park. Certified as a Green Building by the city of West Hollywood, 1345 Havenhurst features resource-efficient design and organically complements the surrounding Hollywood Hills setting. 1345 Havenhurst provides a private, neighborhood setting that’s separate from the energy and excitement of the Sunset Strip, yet within moments from home is West Hollywood’s finest shopping, dining, nightlife, culture, and entertainment. Nearby favorites include Soho House, Chateau Marmont, The Tower Bar, Hyde Sunset Kitchen + Cocktails, and Everleigh. At 1345 Havenhurst, residents can choose to be a part of the social pulse of the Sunset Strip or retreat from it entirely, enjoying a relaxed, residential experience in the heart of West Hollywood. Call or Text Allen at (323) 682-0371 to schedule a tour or inquire further. Same day tour requests can often be accommodated, weekends included.